Chennaiyin FC slumped to another home loss this time to Delhi Dynamos as they went down 1-3 in their final game in the Indian Super League before the international break. The result means, at the mid-season break, Chennaiyin are yet to pick up a win at home from their six games here with just 1 point to show from a 0-0 draw with Kerala Blasters. They will remain at the bottom of the table with just 5 points overall. The match was once again symbolic of what has plagued Chennaiyin throughout the season, an inability to finish off chances. The home side dominated possession and had the vast majority of attempts on goal, but it was visitors Delhi who were more clinical to take the 3 points on offer. After going down to an early goal in the 16th minute from Daniel Lalhlimpuia Chennaiyin equalized in the 39th when they were awarded a penalty for a foul on forward Carlos Salom in the box. Raphael Augusto stepped up to convert with ease to send the teams into halftime level at 1-1. Chennaiyin pressed for the winner in the second half, but were picked off by Delhi on the break as Bikramjit Singh and Nandhakumar S scored to make it 3-1 and give Delhi their first win of the season. 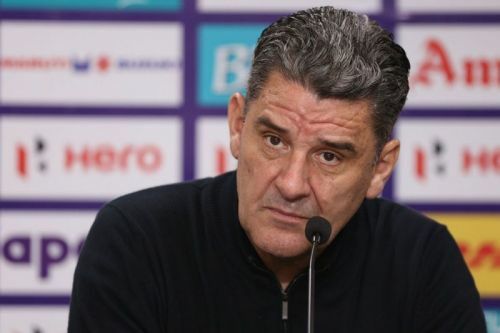 Chennaiyin coach John Gregory was once again left disappointed with the lack of an end product. "Then you gotta score 2 to win the game. The problem becomes ours. We have to do something to get back in the game. We had an abundance of opportunities. So many corners, and a deserved penalty", he went on to add. Gregory was once again left frustrated with his team's inability to score despite creating many chances. Augusto, in fact, had a glorious chance in added time in the first half when he blasted a shot high over the bar when the ball found its way to him inside the box almost at the penalty spot. "We came in 1-1 at halftime, but it should have been 3-0. Then we were chasing the game, we conceded possession and gave away the goal. Stupid mistakes and stupid errors", said a clearly despondent Gregory. After a first half of the year that brought much recognition, the latter half has been a miserable one for Gregory and his team and the strain seemed evident. "We certainly need to make improvements. It’s been a tough 12 game sequence. Only 1 win, 2 draws and 9 losses. Been the worse 3 months of my life", said Gregory. "But ultimately it rests on my shoulders. Our season responsibility is mine to get results." With the team showing an alarming decline compared to last season's title winning run, Gregory was asked if the mid-season transfer window would be something that Chennaiyin would look at. "Obviously the window is open in January. I’ll sit down with Ms. Dani and discuss what we’re going to do about the current situation. Because things have to improve if we are to attempt to challenge for the AFC Cup. It will certainly be a long conversation." For the Indian contingent in the squad, the AFC Cup now becomes the next priority as they will vie for a spot in the final squad for the tournament. Gregory suggested it might do them some good to get away with the national side. "Their (Indian players) next training session will be with the Indian team. They have to be extremely professional about it. They unlike the rest of us have an opportunity to go and play for another team", said Gregory. "They may be happy to go away and play with the national team. Play with their pals. It might be good to get away from the pressure that’s been on them here. Nobody likes to be a part of a losing group", he added. A very disconcerting moment during the match occurred when Chennaiyin left-back Tondomba Singh was sent spinning in the air and tumbling onto his neck when he was hit in the air by Mohammed Sajid Dhot. Gregory came running onto the pitch when it happened in concern. Post the match, he said the player was fine and it was nothing serious. "I was incredibly nervous that something horrible had happened. Could have been a broken neck, broken mouth. There was some blood from his mouth. It was quite frightening. Looked more horrendous than it was. But then he got up and said he was ready to go and he didn’t let himself down."